All went well. Some students even got a job offer after their presentations. 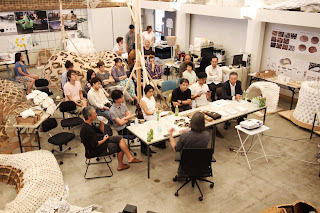 4 design teams had their design thesis defense presentations. Each team was given 16 minutes to present their design proposal followed by a 6-minutes individual research presentation. All projects were reviewed by Kengo Kuma, Manabu Chiba, Yusuke Obuchi, joined by collaborative engineers: Jun Sato, Masayuki Mae, Futoshi Kurisu, and Ryoma Kitagaki. 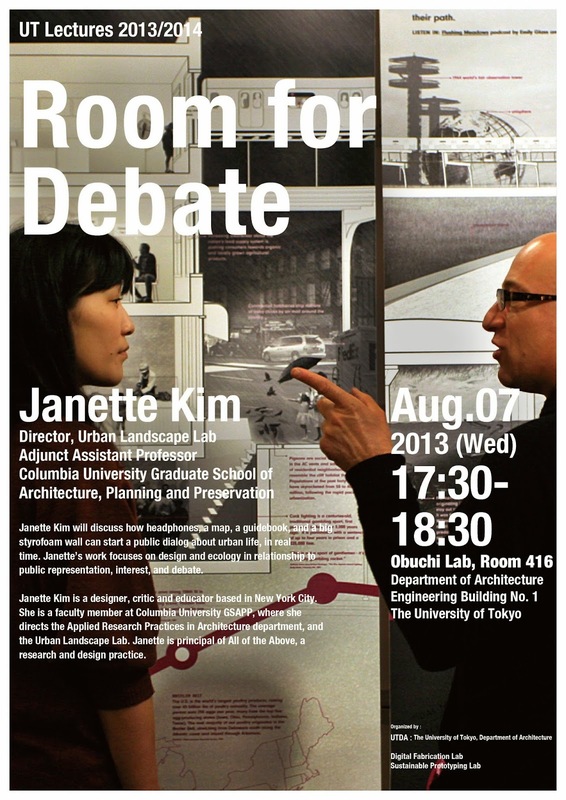 We will have another presentation on Friday with invited guests form outside of the University of Tokyo. Here is a composite image of the assembly process of 1:3 mock-up. 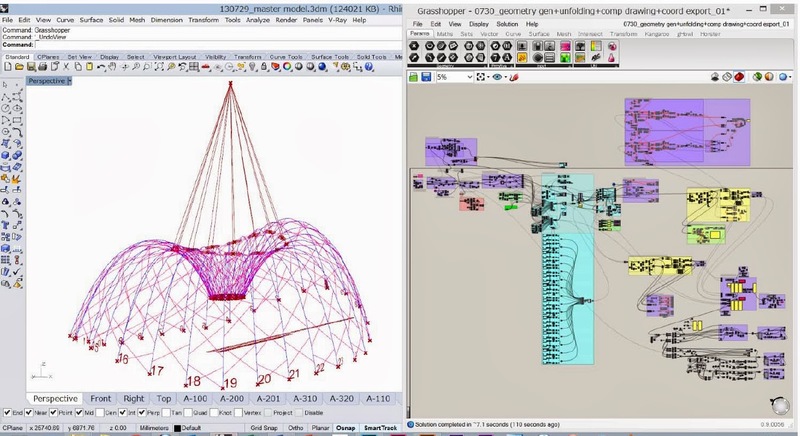 The sequence of events was first simulated with grasshopper and kangaroo during the design development. With samples of components produced by Takenaka-san, we had a meeting with the pavilion team from Obayashi Co. 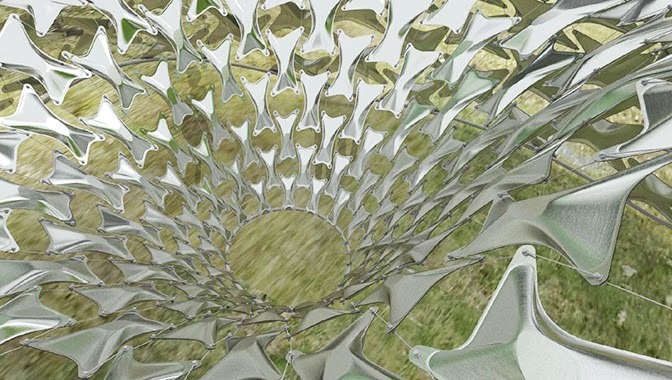 The full-scale version of G30 Summer Pavilion will be a network of compression components made of thin sheets of stainless steel, which are welded and inflated using robotic manufacturing machines available at local fabrication shops near the Toyota Motor’s factory. 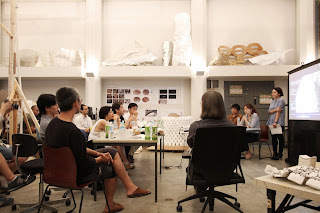 It was a busy day – We had multiple events simultaneously in our lab: a progress review of our pavilion construction with staff from Obayashi Co, 2nd year studio review with Janette Kim, and a meeting for 2nd year book editing. 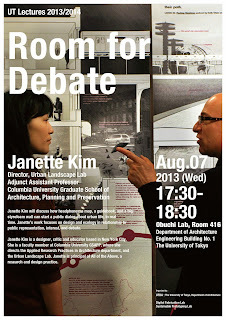 After the studio review, Janette gave a lecture on her recent work, Room for Debate. With the 1:3 scaled model in the middle of our lab space, our lab was quite active all day. Design teams at Obuchi Lab have compiled 2 years of their design research work into a project document book which will be submitted to the Department of Architecture for their final presentation. The document contains one team research book and a series of individual research books. 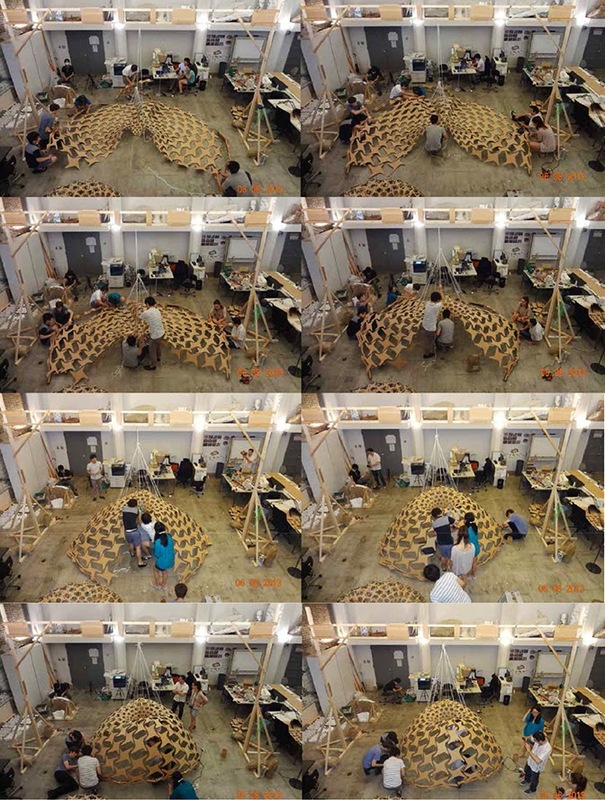 In order to test the accuracy of structural simulations of shell-formed tensegrity structure, we have built 1:3 scaled model. The process of assembly remained the same as our last model, with multiple ropes to hoist the entire structure in one go. 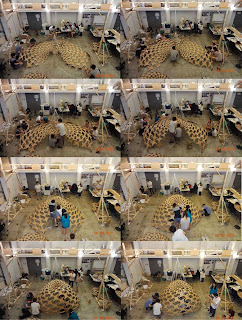 The structural simulations have been a lot more complicated than what we expected; we are collaborating with Prof. Sato and structural engineers from Obayashi Co.
Digital design techniques have radically expanded the “design solution space” available to architects. The speed with which the possibilities for "built" architecture expand, however, is slowing down, in spite of continued advancements in design software development and the dissemination of evermore user-friendly digital design tools. The increasing dissociation between virtual and built environments lies at the foundation of this slowdown. 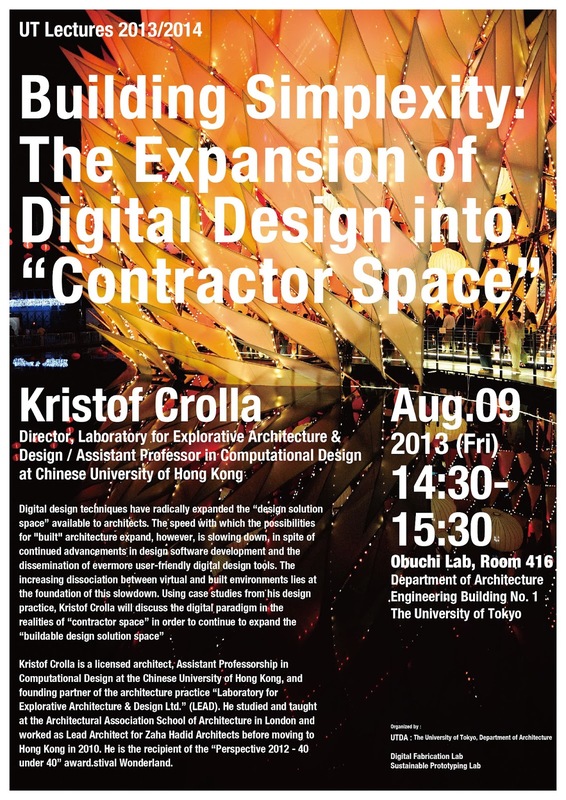 Using case studies from his design practice, Kristof Crolla will discuss the digital paradigm in the realities of “contractor space” in order to continue to expand the “buildable design solution space”. 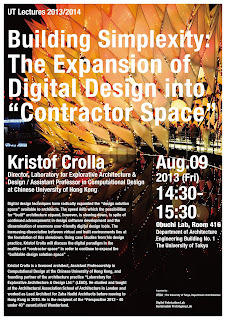 Kristof Crolla is a licensed architect, Assistant Professorship in Computational Design at the Chinese University of Hong Kong, and founding partner of the architecture practice “Laboratory for Explorative Architecture & Design Ltd.” (LEAD). He studied and taught at the Architectural Association School of Architecture in London and worked as Lead Architect for Zaha Hadid Architects before moving to Hong Kong in 2010. He is the recipient of the “Perspective 2012 – 40 under 40” award. 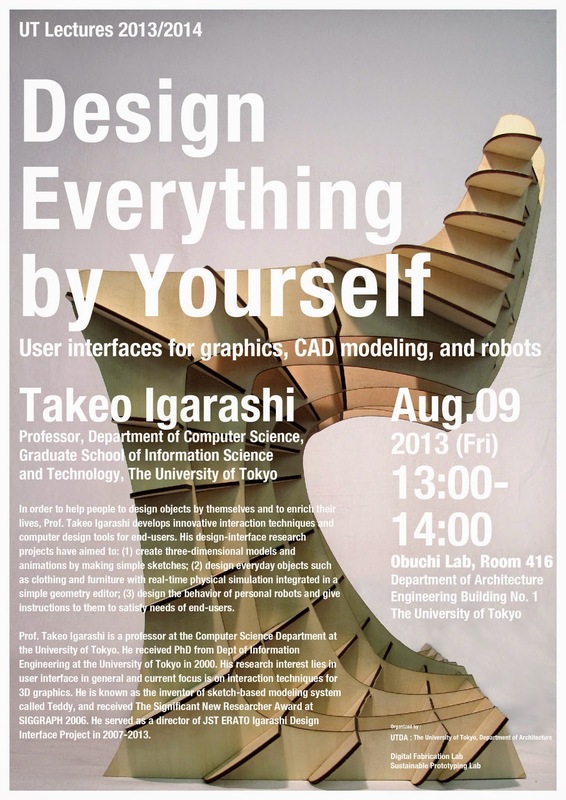 In order to help people to design objects by themselves and to enrich their lives, Prof. Takeo Igarashi develops innovative interaction techniques and computer design tools for end-users. His design-interface research projects have aimed to: (1) create three-dimensional models and animations by making simple sketches; (2) design everyday objects such as clothing and furniture with real-time physical simulation integrated in a simple geometry editor; (3) design the behavior of personal robots and give instructions to them to satisfy needs of end-users. Prof. Takeo Igarashi is a professor at the Computer Science Department at the University of Tokyo. He received PhD from Dept of Information Engineering at the University of Tokyo in 2000. His research interest lies in user interface in general and current focus is on interaction techniques for 3D graphics. He is known as the inventor of sketch-based modeling system called Teddy, and received The Significant New Researcher Award at SIGGRAPH 2006. He served as a director of JST ERATO Igarashi Design Interface Project in 2007-2013. Janette will discuss how headphones, a map, a guidebook, and a big styrofoam wall can start a public dialog about urban life, in real time. 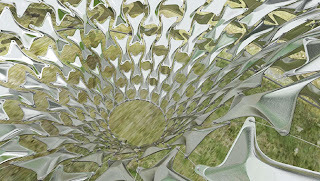 Janette’s work focuses on design and ecology in relationship to public representation, interest, and debate. Janette Kim is a designer, critic and educator based in New York City. She is a faculty member at Columbia University GSAPP, where she directs the Applied Research Practices in Architecture department, and the Urban Landscape Lab. Janette is principal of All of the Above, a research and design practice.